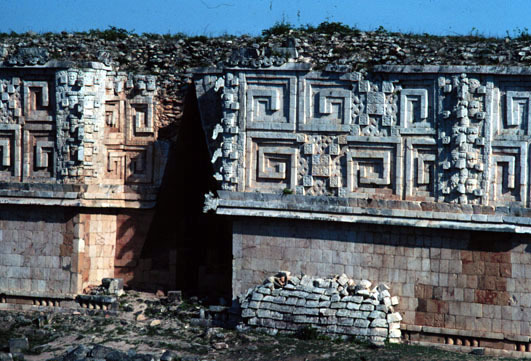 The table below presents views of Uxmal, an archaeological site in Yucatan, Mexico. 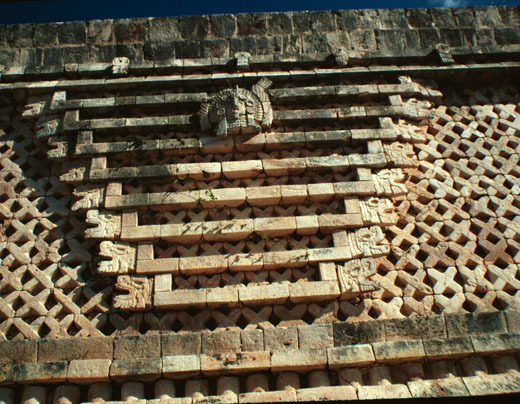 The so-called Nunnery at Uxmal is an irregular quadrangle with buildings on each side. 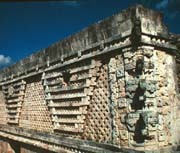 Each building has a distinct pattern to its facade. The same two buildings in this view are seen to the right, in the next frame. The unique Pyramid of the Magician is to the right of this perspective and overlooks the Nunnery Quadrangle. 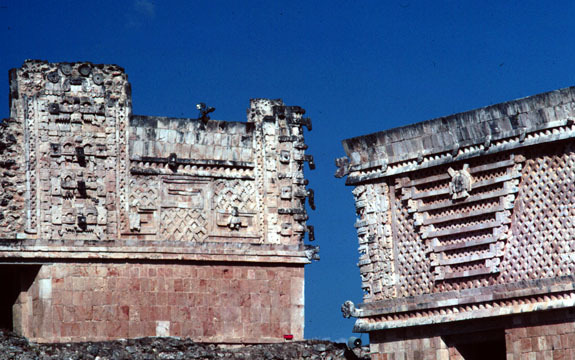 The five detailed views of facades that follow below are of the building on the right. All are of the facade facing the Quadrangle. 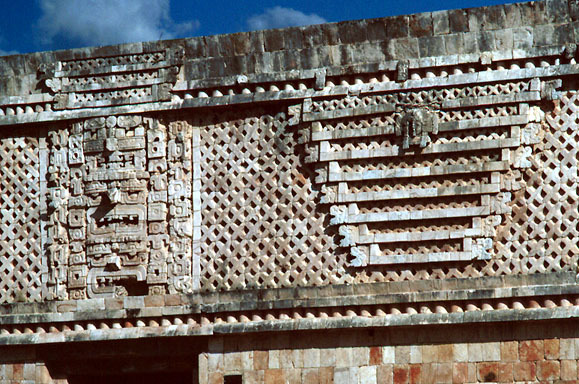 The above pattern with eight double-headed bars is repeated several times along the facade. 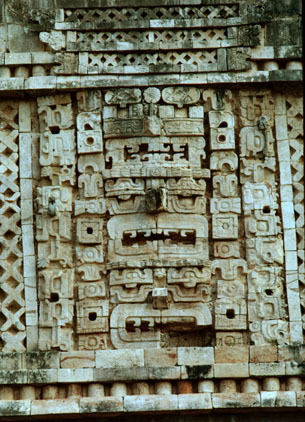 The corners of the upper facade feature three stacked masks. 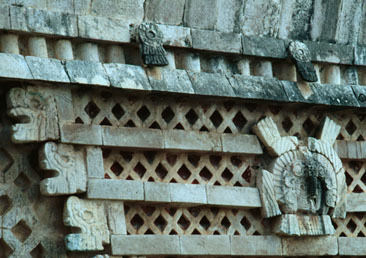 The detail above is also seen above the doorway in the view below. In this close-up the red color between the criss-cross pattern is visible. 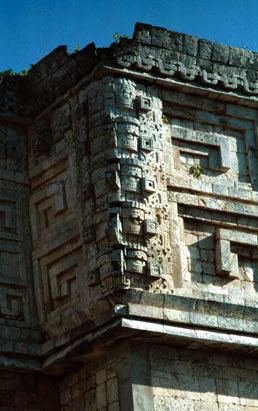 Traces of paint reveal that the complex facades were intricately painted in prehistoric times. The cut and sculptured limestone veneer blocks are attached to a rock rubble and cement core. 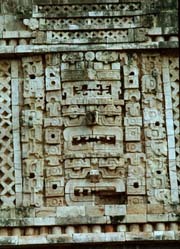 This center doorway faces the quadrangle. This is one of the best restored/preserved areas of the ruins. 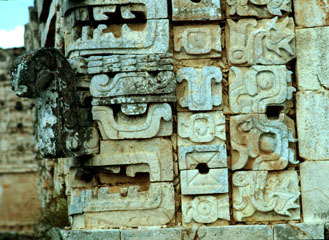 Detail of the corner masks reveals a composition of glyphs, including the symbol for the planet Venus. 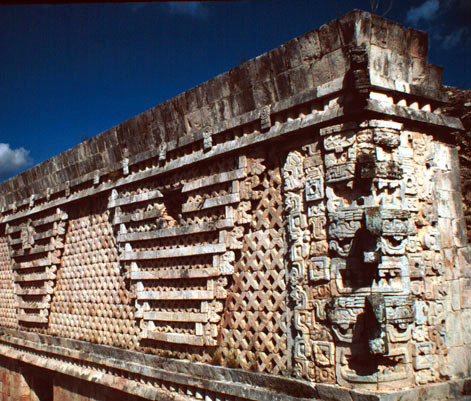 The Palace of the Governors is a large, long building on an elevated platform mound. The building is aligned to Nophat, a mound on the southeast horizon at the southeasterly maximum rise position for Venus. The Palace of the Governors has five masks stacked on its eight corners, numbers that correspond to 5 Venus synodic cycles in 8 years.